A Look at Friday’s Market: The overall market moved sharply lower on Friday in a broad based move that saw the majority of the sector indices I track move lower as well. There was weakness in the Gold/Silver, High Tech, Commodities, Oil Services, Biotech, Natural Gas, Chemicals, Oil & Gas, Cyclicals, Transports, Consumer, Financials, Healthcare related indices. There was strength in the retailers. There was weakness in the bond market as interest rates moved higher. In the commodities markets, Oil was lower by $2.23 to $84.86 per barrel, and Gold was lower by $40.30 to $1,675.20 per ounce. In the grain markets, Wheat was lower by $0.04 to $8.644 per bushel, and Corn was lower by $11.40 to $7.394 per bushel, while Soybeans were lower by $0.33 to $15.266 per bushel. A Few Thoughts on Monday’s Market: In looking at the charts from Friday’s market it is pretty clear that the vast majority of the various indices I follow are in a downward trend. I think the market is going to drift lower until the results of tomorrow’s election are known. Of note, the M.S. Commodities Index ‘CRX’ closed at 829.57 on Friday and in the process broke through downside support at 833.17 I have included a chart below for your review. I am now seeing downside support on the ‘CRX’ at 819.20 and then at 798.04, the point from which it gapped higher on the open of trading on September 6th of this year. 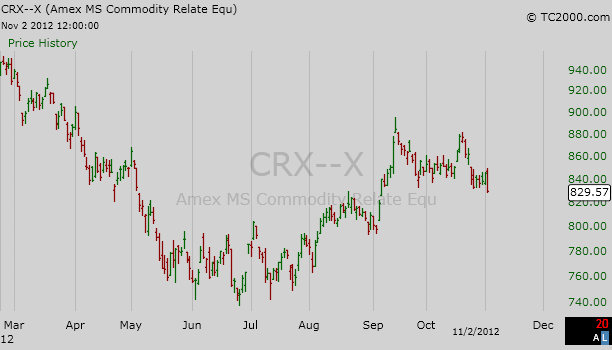 I am expecting the ‘CRX’ to continue to move lower and test those trading levels over the course of the next couple of weeks. The Dow Jones Industrial Average: The Dow Jones Industrial Average closed at 13,093.162 I see upside resistance level on the Dow Jones Industrial Average at 13,275.20 on a closing basis. I now see downside support coming in at 13,000.71 and then at 12,943.82 on a closing basis. I should point out that the support level at the 12,943.82 level is basically a “double bottom” on the charts and breaking through this level would be significant. Current Expectations: I think we are starting a new trend lower in the Dow. I am expecting the Dow Jones Industrial Average to continue to move lower and test 13,000.71 and then 12,943.82 on a closing basis. Dow Jones Transportation Average: The Dow Jones Transportation Average closed at 5,110.17 I see upside resistance on the the Dow Transportation Average at 5,215.97 and downside support at 4,873.76 and then at 4,795.28. Current Expectations: I think the Dow Transports are going to track sideways between support and resistance for the foreseeable future. NASDAQ 100 Index ‘NDX’: The NDX closed yesterday at 2,656.25 I see upside resistance on the NDX currently at 2,687.52 and downside support at 2,647.47 and then at 2,623.33 on a closing basis. Current Expectations: I think the NDX is going to continue to move lower and test 2,647.47 and then 2,623.33 on a closing basis.